Although I am dreading snow this year (being pregnant and icy ground does NOT mix well), I love snowy themed Christmas cards. 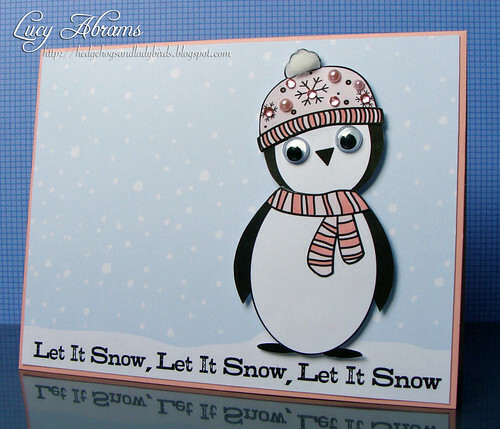 And I've always loved this sweet Cap and Scarf penguin stamp. I am so happy it's now digi and I can make it BIG! It's in the new Christmas Critters digikit. Oh Lucy, this is the cutest card ever. This is adorable!!! That penguin is sooo cute! Love the googley eyes on the penguin. Ah! He is so super cute! Love him as the focal point on the card!